​Richard has compiled a history of Australian Holden cars from 1948 to 1984. While looking for information on my old Holden, I realised that data on original equipment and model specifications was hard to find. At the same time, photos documenting original Holden cars on the internet are rare. To this end, I have put together an image library of GM Holden cars from 1948 to the present day. Some pictures copyright GM. Holden Monaro cars are documented in their own gallery and utility models are in Holden Ute History. For newer models, see Holden Commodore 1978-2013. Scroll through to range the history or click an image below to see more details on that particular model. 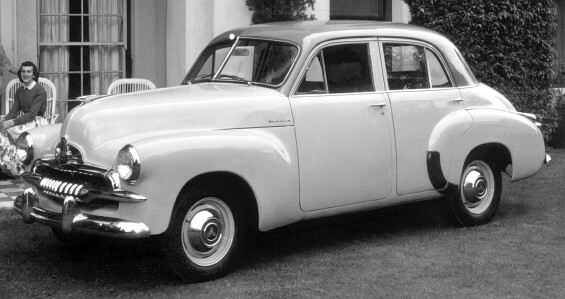 The 48-215 (below) is more commonly known as the FX Holden and was the first fully Australian assembled car built for the Australian domestic market. It was very enthusiastically received at that time. The FJ Holden was introduced in 1953 using similar mechanicals but with upgrades to engine power and significantly more chrome up front. The FJ became an iconic Australian car and even though its styling was outdated compared to contemporary American cars, it was a massive hit in Australia. Many were exported to New Zealand starting with the "Ute" model in 1956. 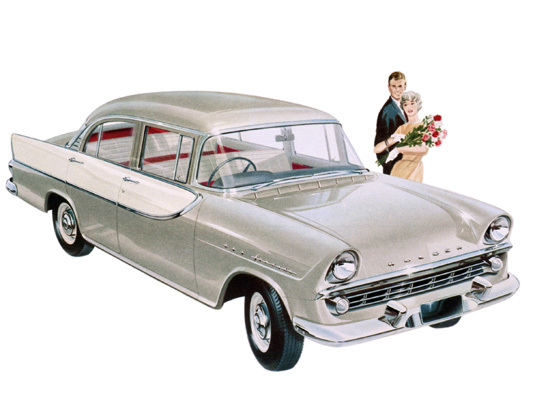 The FE Holden took it's styling cues from the wildly popular mid-fifties Chevys downscaled to suit the Australian market. It was quite a feat at the time to get the '56 FC Holden to look like a '55 Chev! While it was much more modern looking than the FJ that preceded it, the mechanicals were not significantly upgraded other than upgrades to engine power and better (drum) brakes. The FC Holden updated the previous model by taking further styling cues from the '55 and '56 Chev using more chrome on the side strip and slightly integrating the grill. The FB Holden continued with the mid-fifties theme even though it was starting to look a little dated in 1960 it was stil considered a big jump forward in terms of styling, it looked like a miniature '56 Chev. The EK Holden was a styling update to the FB and add some additional two-tone paint colours and minor tweaks to the trim. The EJ Holden was a big step forward in style and it brought Holden well-and-truly into the sixties with a design that is considered by many to be one of the best designs Holden ever produced. A lot more than just a styling upgrade, the EJ Holden debuted the up-market Premier models and heralded the beginning of the availability of a consideration amount of accessories to add to each model to personalise it. These accessories are very sought after by collectors today. The EH Holden updated the EJ with new sheet and tail lights at the back and a slightly altered grill. New engine combinations would set the scene for many years to come with the release of Holdens new “red” motor in the EH Holden. You had a choice of 149 or 179 “HP” cubic inch variants that had a seven bearing steel crank. These motors were often used to re-power early Holdens as they had up to 50% more power than the early “grey” motors and a lot more than that with a few simple modifications. The HD Holden was a controversial styling change that was a bit too adventurous for some at the time and a more successful HR model was to follow soon after. Critics complained of the narrow track that carried over from the EH Holden even though the body was considerably wider. The HR Holden was apparently rushed out due to criticism of the previous models "pointy" fin front-end. There were minor changes were to the front panels, subtle changes to the roofline and rear window and additional lights in the grill. Importantly the HR got a wider track to address criticism of the handling of the previous model and also saw the debut of the mighty 186cu.in. motor. The HK Holden followed and introduced another major step forward in styling and engines. Much more American looking and a bigger car by every measure, the HK Holden also introduced the famous Chev-engined Monaro coupe models. The stripes embedded into the hood sheet metal just begged for hoons to paint in racing stripes. Strangely the Monaro models used stripes off to one side and it was only later models that emphasised the shape on the bonnet. 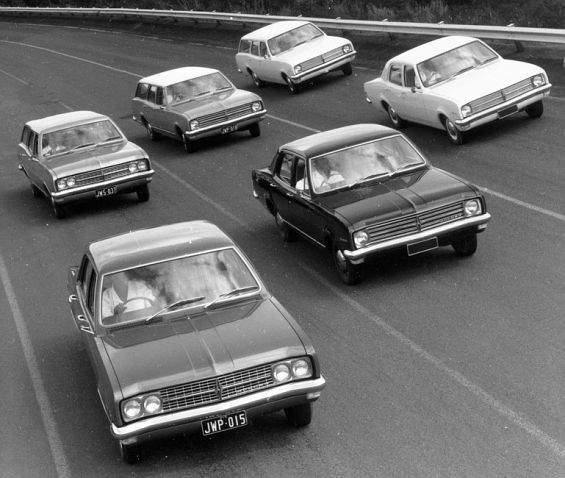 Amazingly, by the time the HK Holden was replaced with the HT in 1969, Holden had managed to release a new model almost every two years since they started in 1948! This would end in the early seventies when the "oil shock" arrived and longer-lived models survived the end of the muscle car era. Many cosmetic and engineering changes were introduced on the HT model including trim and suspension changes to keep up with the competition. The HG Holden was a minor update for the HT to keep costs low and in anticipation of a major update the following year. A different grill was introduced but the models stayed pretty much the same as the previous year. My dad had a brown Kingswood, same brown as the photo below with a cream coloured roof. Classy! The HQ Holden is considered to be the best looking Holden model released to date and it was easily the best selling Holden of the pre-Commodore era. Many body style variations were created and engines ranged from weezy 6-cylinder Holden engines to the mighty 350 cubic inch Chevrolet small block. The HJ Holden had a hard act to follow and while no major mechanical updates were added, the tail lights, grill and interior received enough changes to update the overall package at the expense of some of the subtlety of the original design. Typically seventies colours were available some even brighter than the previous model. The HX Holden brought only minor styling changes and some engine changes due to further emissions requirements imposed by the Government. Most cars at this time had radial tyres from new however the suspension was not really up to the same standard. The outrageous colours continued to be used throughout the seventies. Yeah baby! The HZ Holden finally brought the handling up to the standard it should have been all along. Radial Tuned Suspension (RTS) was introduced on the HZ (and other Holden models) at this time including wider rims and tyres. The WB Holden was designed to replace the HZ across the range but it was decided to discontinue the Holden range based on this platform and build on a new platform that was lighter and more fuel efficient. The new platform was based on the Opel and would be the start another 30 years of Holden. The WB Holden was produced in both commercial vehicles (ute) and long-wheelbase Caprice versions, complete opposite ends of the scale. The WB Holden used a few parts from the Commodores (metric) parts bin. This included wheel hubs (same metric bolt pattern) and the engines (using more modern fuel injection). 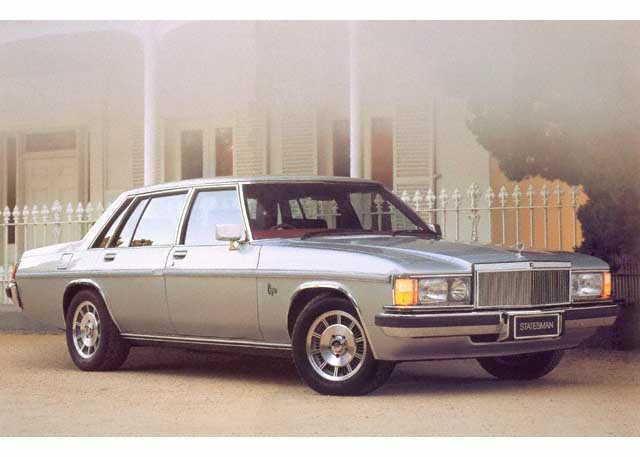 The Commodore range would eventually include a long wheelbase model but it would be many years after the WB Caprice ended production in 1984.